The first thing you notice is an all-encompassing green; 58% of the entire nation of Slovenia is covered in forest, and nowhere is that more apparent than at its heart. The lushest of valleys sweep across the horizon alongside undulating hills that seem to never end. Slovenia is arguably the aesthetic jewel in the European crown, undeniably gorgeous with a vast array of landscapes ready to make your jaw hit the ground. Claiming one area is prettier than another is always going to be subject to taste, but we’re hard pushed to put anywhere above the region aptly named Heart of Slovenia (or Srce Slovenije in Slovene). Seven municipalities make up our guide to the nations beating heart – Kamnik, Domžale, Litija, Mengeš, Trzin, Dol Pri Ljubljani and Lukavica – bringing sights and sounds aplenty to the Slovene touristic table. In the Heart of Slovenia, the life of the past and life in the present sidle up next to each other in complete comfort. The land east of Ljubljana has been a regional crossroads for centuries, and the rivers that cross this territory pay testament to a long and storied history. Roman ruins, baroque churches, adorable villages and 21st century health centres are surrounded by views of the mountains, luscious greenery and river walks in a compact kaleidoscope of everything that Slovenia has to offer. Compact is the right word, meaning exploring this stunning region couldn’t be easier. So hop in the car, roll the windows down and take in the sumptuous beauty and tradition of the slow beating Heart of Slovenia. THE Slovenia Book present’s Slovenia’s Top 100 Destinations, tons of interviews and Top 10 lists, hundreds of amazing photos and lots more! Click for more info. 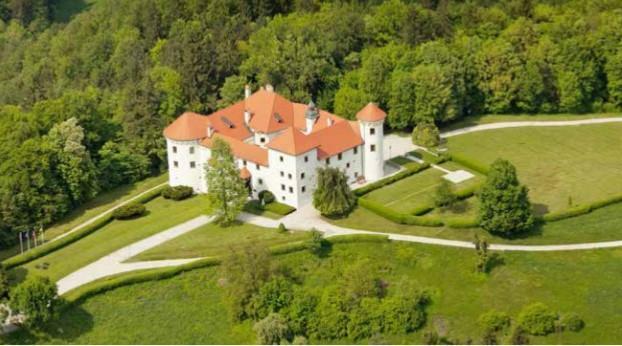 BOGENŠPERK CASTLE: Found in the high hills to the southeast of Litija, Bogenšperk is one of the most storied castles in all of Slovenia, which is no small feat given the competition. Dating back to the middle of the 12th century, when a medieval fortress was built by the Lichtenburg family, today’s fully restored castle owes its appearance to the Renaissance and is considered as one of the most beautiful from the period. In addition to being one of Slovenia’s most popular wedding venues, Bogenšperk boasts many interesting museum collections, including graphics, hunting paraphernalia, a copper printery and a Slovenian folk exhibition with a special focus on witches. However, the estate is most famed for being the former home of Slovene polymath and member of the Royal Society in London, Janez Vajkard Valvasor, who purchased it in 1672, and many of the items in the aforementioned exhibitions come from his personal collections. Opening hours and tours vary widely depending on season, so it’s best to check the website for the most current information. Info: Bogenšperk 5, Šmartno pri Litiji, +386 1 898 78 67, bogensperk@siol.net, www.bogensperk.si. LAND OF CHARCOAL BURNERS: A mere 25km outside of Litija and you are far away from the hustle and bustle of the modern world, finding yourself in serenity as far as the eye can see through the rolling hills. You may also start to notice smoking black piles, piquing your curiosity. What they are is in fact examples of the ancient art of charcoal burning. It may be a dying art, but those in the vicinity of Dole pri Litiji are doing their best to keep it alive. The mounds of smoke are strangely beautiful, in particularly when they start to die out and the smokes turns to a royal shade of blue. The 2,000 hectares of gorgeous greenery also helps. Phone ahead to make a prior arrangement for visiting. Info: Dole Pri Litiji, Litija, +386 (0)31 643 625, info@dole.si, www.dole.si.